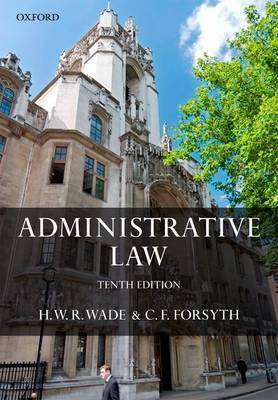 Wade & Forsyth's Administrative Law provides a comprehensive and perceptive account of the principles of judicial review and a sketch of the administrative arrangements of the United Kingdom. Since publication of the first edition in 1961, Administrative Law has established itself amongst the foremost rank of legal textbooks, and is frequently cited with approval in the higher courts. In the tenth edition, Christopher Forsyth has brought this classic account of administrative law fully up to date in light of recent case law and legislation, especially regarding the continuing transformation of this branch of the law by the Human Rights Act 1998. The book's clarity of exposition makes it accessible to the student approaching the subject for the first time, whilst its breadth of coverage and perceptive insight ensure its value to all interested in this field, academics and practitioners alike.